Florida Atlantic University and the University of Miami had slow starts passing the ball. Running the ball, well the Hurricanes ran with it literally and figuratively. FAU finished the first half with 17 carries and one yard. Mark Walton rushed for career highs of 155 yards and four touchdowns, and No. 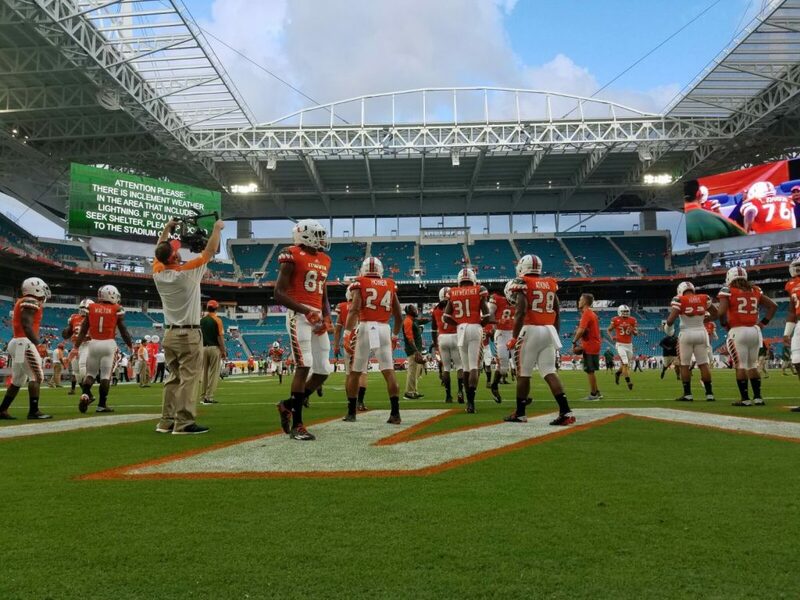 25 Miami beat Florida Atlantic 38-10. Walton ran for three touchdowns against FAU a year ago, and this time became the sixth Miami back in program history to rush for four in a game. Walton was suspended for much of the offseason after a drunken-driving arrest, a charge that was dropped, and said he’s had a chip on his shoulder since returning. Joseph Yearby contributed to the backfield running for 121 yards and a score for the Hurricanes. Miami outgained FAU 470-214, and forced nine punts for the second consecutive game. Greg Howell rushed for 75 yards and a touchdown for FAU. Jason Driskel completed 18 of 36 passes for 167 yards for the Owls, who punted on their first seven possessions. This was not a Picasso for the Hurricanes. There were drops and a missed field goal for the second straight week not to mention bad penalties. The Owls visit Kansas State next. Hurricanes visit Appalachian State. The Mountaineers are 18-3 in their last 21 games, and the biggest crowd in the history of Kidd Brewer Stadium is expected.